Anyway, these tarts are soooooo good that I decided to come out from my hiatus so to share this recipe ASAP. It's that good! I love the addition of the black sesame seeds in the sweet pastry case. The unmistakably nutty sesame flavour in the pastry case adds an almost savory-like element to the tarts, not overpowering as sesame seeds can be sometimes, but rather a gentle note that has a somewhat lingering familiarity. Matcha is the star of the show of course. For anyone who is concerned about the bitterness, typical of Matcha, these tarts carry the flavour but not the bitterness. 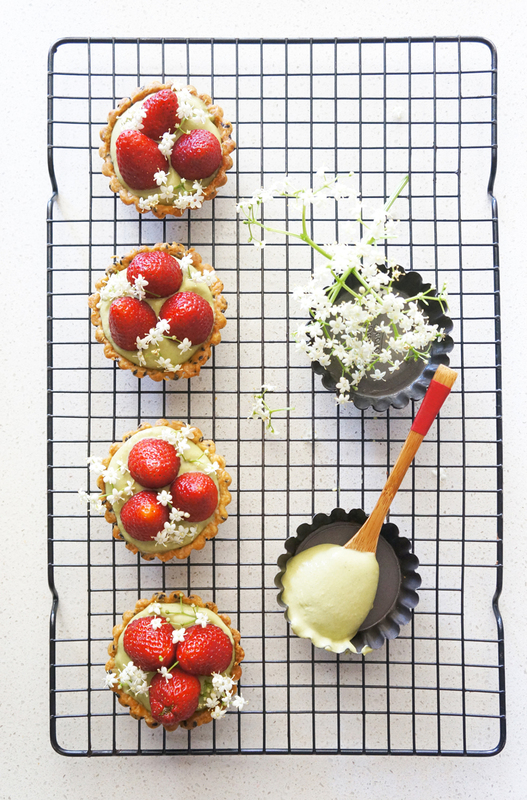 And the pretty jade green pastry cream makes the tarts seem deceptively healthy. Green means healthy, right? I'm so excited to finally use the elderflowers from my garden. I planted the elderflowers last winter with hope that I will be able to use them to decorate my desserts. The elderflowers exceed beyond expectation, with constant blooms since spring. Ahhh, the joy of gardening. You will also need fresh strawberries (and elderflowers to decorate). Place butter, sugar, salt, flour and sesame seeds in a food processor and process until the mixture resembles fine crumbs. Add water and process until the dough just comes together. Turn out the pastry, flatten into a disc, wrap with plastic wrap and refrigerate for 30 minutes. Preheat the oven to 180 degree celcius fan-forced. Place tart tins on baking tray. Line the pastry with a sheet of baking paper and pour in dried beans or rice. Bake for 15 minutes. Remove paper and beans/rice. Return to the oven for another 10 minutes, or until light golden. Set aside to cool completely. Place the cream in a saucepan over high heat and bring to just below boiling point. Place egg yolks, sugar and matcha in a heatproof bowl and whisk until creamy. While whisking, slowly pour the hot cream over the matcha mixture. Set the bowl over a saucepan of simmering water (don’t let the bowl touch the water) and stir custard with a wooden spoon for 4-6 minutes until mixture coats the back of the spoon. Cover surface with plastic wrap and chill for 2 hours or until cold. Transfer to a stand mixer, add double cream and whisk until soft peaks form. 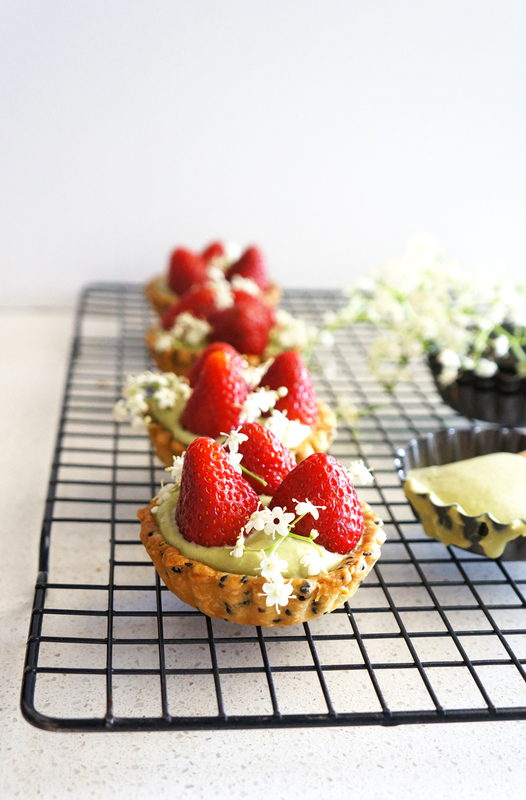 To assemble the tart, spoon the matcha cream into the tart shells and top with the strawberries (and elderflowers).